What Google’s Hummingbird update means to you. It is almost 3 weeks since the Google’s Hummingbird landed bringing with it sweeping changes that can be noticed only when deeply go into it. As a blogger, I make it a point to read several authority blogs on search engine changes. Thus far, whatever I read about Humming bird algorithm update did not make me any changes in my blogging style because I always wrote in conversational style and never really wove a blog post with one keyword in mind. After reading various blog posts on the effect of Hummingbird update, this is what I understood. · Google conducts a semantic search and give out results based on its knowledge about you the searcher based on your previous search pattern, your social sharing trends and even your location. · As far as SEO is concerned, you are still required to build links so that your linking sites actually drive traffic. It implies that we have to build links not get to the link juice but to get traffic. 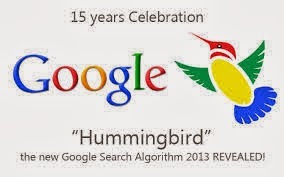 What is the Google Hummingbird algorithm? Why is the Google Hummingbird algorithm important? How does Hummingbird prepare for new search trends? How does the Hummingbird algorithm affect SEO? What should SEOs and Webmasters do going forward to best take advantage of the Google Hummingbird algorithm? What are a few new post-Hummingbird SEO best practices? Full credit to Steam Feed for providing great insight into Hummingbird algo update.